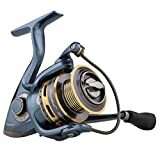 Best Spinning Reel Under 50 Dollars - Read This Before Purchasing! For under 50 dollars, you can purchase a high quality spinning reel to get you out on the water catching fish. With proper maintenance and care, a reel purchased on a budget can actually last you many years. I have friends with top end rods like G Loomis and they are still fishing with some of the reels shown here, which says a lot about their quality. So whether you want a backup reel, your first good fishing reel, or your go to reel, any of these will meet the rigorous demands of fishing and more. Read more here about how to choose the top spinning reel under 50, or to help you decide between a baitcasting and a spinning reel click here. Whther you are a beginner or an expert, there are many options for the best spinning reel under 50 dollars. Continue reading to find your perfect reel. The "B" at the end of the model number represents the type of packaging (B= Claim, X= Box) and does not affect any of the specifications of the product. The Pflueger President series may be one of the better known series available on the market due to their smoothness and quality. The 6935 model is perfect for fish like bass, northern pike, walleyes, and anything smaller – pretty much most freshwater fish. With a body made of graphite and then non-moving parts made of plastic, this reel is strong and durable as well. The President has 9 ball bearings plus one roller bearing for a total of 10 bearings to make this a very smooth reel. As reels get cheaper, normally manufacturers skimp on the ball bearings and sacrifice smoothness, but not here. 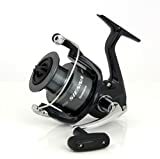 This reel is also able to hold 185 yards of 8 pound test monofilament, which is quite a bit and this reel could easily be used for 10 pound test as well, or braid in the same diameter. The drag is smooth and can be tightened down to stop up to 10 pounds of fighting fish. The retrieve ratio is 5.2:1, meaning this may not be the fastest reel available but it has the power to pull fish around, and certainly isn’t slow. It reels in about 25 inches per full rotation of the handle. The President certainly lives up to it’s name as one of the top reels available. They are definitely some of the most well-known across the fishing industry for a very good reason. The Abu Garcia Cardinal is a solid reel from a great company, and you will find it on many rods across the world. Here, we are reviewing the STX30 model, which has a capacity of 175 yards of 8 pound test mono. It has 6 ball bearings and 1 roller bearing to make it a very smooth reel as well, though perhaps not so much as the President. The body of this reel is made of graphite and plastic for a total weight of 9.2 ounces, lighter than the President. The Cardinal has a gear ratio of 5.1:1, which is good enough to pull 29″ of line in every rotation. This is surprisingly fast for a reel with a gear ratio like that, making it a good combination of speed and power. The drag system is good up to 14 pounds for fighting very good sized fish with. If you are looking for a faster reel than the President, this reel does retrieve line slightly faster, and is also lighter. It does have less ball bearings and may be a little less smooth, so it depends on what you are looking for out of your reel. The cheapest out of these three reels, the Sienna is well built and durable, just like everything Shimano makes. Like the others, it is made of graphite and plastic but weighs less, coming in at only 9 ounces. It also has a smaller line capacity, holding 140 yards of 8 pound test line. This reel has only 3 ball bearings and one roller bearing, so it is definitely the least smooth out of all three, though still fairly smooth. It has a 5.2:1 gear ratio, once again a decent balance between power and speed. Each full rotation of the reel will result in 29 inches of line brought in. 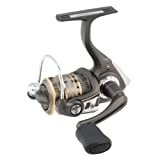 The biggest thing this reel has going for it is the price, at 34 dollars it is one of the most dependable reels available. It is fairly smooth and does have power to reel in good sized fish. Read more information about Shimano and you’ll be hooked! For the best reel under 50 dollars, you’ll have to decide out of the three reels discussed above which one fits your needs best. Are you looking for a smooth reel in the President, a smooth and slightly faster reel in the Cardinal, or just a reliable, cheap spinning reel that is fairly smooth and fast in the Sienna? Good luck deciding, and great luck fishing!